The Sikh Times - Biographies - Rosa Parks: Happy Birthday! Ilena Rosenthal is the director of the Humantics Foundation. "Ninety years ago this week, in an America fraught with racism and state-enforced segregation, Rosa Louise McCauley was born in rural Alabama. This woman who had no more than a high school education would go on to become an American icon of unwavering resistance to oppression. In Quiet Strength: The Faith, the Hope, and the Heart of a Woman Who Changed a Nation, an autobiography, Parks strongly emphasizes: 'I would like to be known as a person who is concerned about freedom and equality and justice and prosperity for all people.' "
"Many of her early memories are laced with trepidation: listening to nearby lynchings by the Ku Klux Klan, fearful that her house too, might be ravaged and burned to the ground. Her birthplace, Tuskegee, at the time enjoyed an illustrious place in African American history as the home of Booker T. Washington's Tuskegee Institute but would later become infamous for the 40-year government-sponsored experiments that left poor black men with syphilis untreated so the progress of their symptoms could be recorded. This graceful, soft-spoken granddaughter of slaves grew up to commit an act of defiance of such magnitude that the law and America were changed forever. Parks 'sat down' for justice and equality." "At 19, Parks met and soon married a skilled and handsome barber, Raymond Parks. He was 10 years her senior and a passionate civil rights activist. 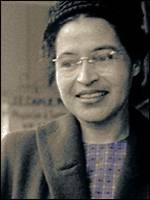 In her first autobiography, Rosa Parks: My Story, she recalled what had impressed her the most. 'He didn't seem to have that meek attitude - what we called an 'Uncle Tom' attitude - toward white people.' Articulate and bold, with little formal education, it was he who encouraged her to complete her high school education at age 21. The couple's lives were constrained daily by 'Jim Crow' laws that enforced segregated elevators, buses, water fountains, restaurants and housing - all made legal by a set of Supreme Court decisions in the late 1800s that remained valid for 70 years." "One of the first women in the local National Association for the Advancement of Colored People [N.A.A.C.P. ], Parks was elected secretary in the early 1940s, and diligently worked to change the subjective and unfair 'literacy tests,' which prevented most blacks from voting. On Dec. 1, 1955, when 42-year-old Rosa Parks refused to give up her seat to a white man on the Cleveland Avenue bus after a long day's work as a seamstress, she was painfully reminded of an experience with the same driver, 12 years earlier. That event had ended with her humiliating eviction from the bus. This time, she recalled, 'God sat with me as I remained calm and determined not to be treated with less dignity than any other citizen of Montgomery.' "
"She was summarily arrested and then released on bail. As the news spread throughout the African American community, a movement to organize a boycott of the municipal bus system quickly began. Rev. Martin Luther King, Jr., then a 26-year-old unknown, added his resonant voice to the bus boycott already being organized for Dec. 5, Parks' day in court. As expected, she was convicted for her act of rebelliousness. Her fine: $14. The black community joined and untold thousands of African Americans walked, carpooled, took taxis, rode mules and even missed work and school, leaving the city buses to run nearly empty. Both Parks' faith - and the boycott - endured, the latter for 381 days. In late 1956 the Supreme Court ruled that Montgomery's transportation segregation laws were unconstitutional." "She continues to stand for her beliefs in equity, justice and mercy. In 1994, after being beaten in her own home [in Detroit] by an unemployed black youth who robbed her of $53, she responded, 'I pray for this young man and the conditions in our country that have made him this way.' "